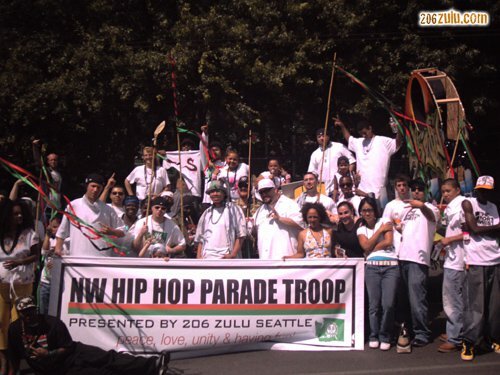 The NW Hip Hop Parade Troop is the Northwest’s one-and-only Hip Hop parade troop, a festive and innovative approach in showcasing Hip Hop culture to the public. The troop consists of a people’s march, b-boys and b-girls (dancers), a 3-dimensional graffiti float with emcees and deejays. One of today’s major influences among youth and adults across the globe is Hip-Hop. It is recognized as an authentic culture, with music, dance, art, language, fashion, principles, and other cultural elements combined that not only entertains, but also educates, and impacts millions of lives. Once the music industry and mainstream media began to use Hip-Hop as a marketing tool, it eventually became billion dollar industry. This initiated a power shift from the spirit of innovation to those willing to sacrifice artistic integrity in favor of a more profit driven buisness model. The resulted current climate of media perpetuates immoral and intellectually deficient standards for society. Hip Hop is being commodified. This parade troop aims to spread awareness by educating the masses about the culture, dispelling the negative misconceptions that it receives by focusing on Hip Hop’s fundamental qualities of Self-Empowerment, Identity, Peace, Love, Unity, and Having Fun. We acknowledge Hip Hop as an uplifting culture that influences and heals millions of lives through the artistic expressions of music, art, and dance. As guardians of Hip Hop, we aim to preserve its History/Herstory, integrity, and assist in the nurturing of a healthy and progressive culture so that it may continue to unify and empower people of all walks of life. We march in solidarity to demonstrate the strength of our community. Umoja Festival is the Northwest’s oldest and largest Black Community Festival. Continuing the tradition that began over 50 years ago with the “Seattle Mardi Gras Parade” the parade features drill teams, African drum & dance, masquerades, floats, youth and community organizations and more. The parade will begin at 23rd & Union and travel south on 23rd Avenue to the festival grounds at Judkins Park. For more information, click HERE.